The Rapidian wants to know: how do you define your geographies? A couple weeks ago I previewed one of The Rapidian’s newest features - the neighborhood drill down. 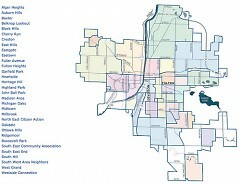 That article showed one of the ways that The Rapidian is collecting geographical information about each of the stories on the site and recommended some great community tools for learning more about Grand Rapids neighborhoods - specifically how to use tools provided by the Grand Valley State University’s Community Research Institute (CRI) to find out exactly which neighborhood (or neighborhoods) one’s story falls in. 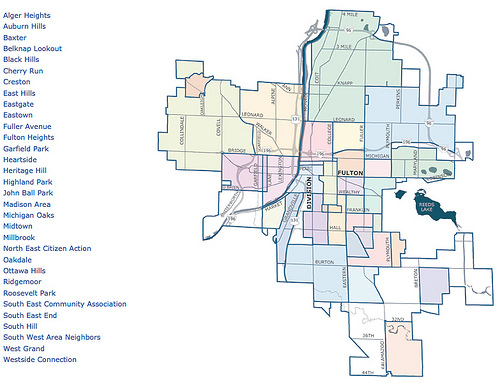 Like CRI, we are currently basing our geographies on what the city of Grand Rapids recognizes as official neighborhoods. For a variety of reasons, this is not likely to change any time soon, but we also understand that not everyone knows or accepts the boundaries of city-recognized neighborhoods (the city, coincidently, uses CRI's map as well). As we get deeper into categorizing content by geography it would be awesome to get a sense of how people define their own neighborhoods. What do you call where you live? How do you define where you live? Please feel free to respond below or, if it is more comfortable, to email me directly at [email protected]. I can’t wait to see how people define their geographies! Also, historically residents centered their daily lives and connections around the nearest commercial district rather than a residential-only neighborhood. The four business districts of Uptown are where I do most of my shopping/dining/working so for that reason my tendencies are to associate myself with "Uptown" where I meet my friends and spend most of my waking hours. Most of the "neighborhoods" were charted and named by the city during the early 80s. The effort was primarily a way to define service areas based on Federal Community Development Block Grant fudning. East Hills for example was named such because it fell between the two established neighborhoods of Eastown and Heritage Hill. Uptown is a curious beast. Uptown, historically speaking, was the orginal moniker of the Creston area, being north of downtown. About ten years ago a collaboration between business districts and neighborhood associations on the southeast side adopted the Uptown moniker for their own. The area that is now referred to as Uptown was historically refered to as the East End. We live in an area of downtown that the City calls Hillside. I never heard this area referred to as Hillside until we moved here. I am assuming that this was one of those areas renamed in the 80s. The downtown areas were another arbitrary naming process that happened as part of a marketing scheme several years back which included adding Center City and Hillside to the naming mix. Essentially Hillside is just a portion of Heritage Hill and Center City is just downtown. Heartside, to the south of downtown has had it own issues with trying to re-brand portions of the neighborhood as the Arena District and the Ionia Entertainment District. I don't see my neighborhood on the "Official List" is there a reason for that? I live smack in the middle of the the richest cultural environment I have ever experienced. Within walking distance of everything I am interested in from GRCC to art, music and Amtrak for a quick trip to Chicago or Metro Detroit. Of the decade or so I have lived in Grand Rapids, my best memories come from this funky social experiment.